If you're thinking about growing banana plants indoors, this is the one that you want. Most banana varieties grow too big to keep as house plants. However, this is a compact type that only reaches about 6 ft when mature. You'll find Dwarf Banana Plants from online nurseries and some garden centers in spring and summer. Although banana plants look like trees, their trunks are not woody, but are actually pseudostems formed from overlapping leaf sheaths. The pseudostems grow from rhizomes beneath the soil. Its broad, shiny leaves -- growing 2-3 ft (60-90 cm) long -- are enough to qualify the plant as a beautiful, tropical accent for your home. However, given enough warmth and sunshine, bunches of bananas are entirely possible. About the bananas: Each pseudostem will produce one purplish-red flower cluster, which develops fruit. The bananas are about 6 in (15 cm) long and edible. Cut off the bunch when the fruits are well-formed. If you want, you can harvest them a week before ripening. Hang them in a shaded spot, allowing the bananas to continue to ripen and develop flavor. Once a stem grows fruit, it dies. Cut the stem off and allow the offsets to take over. Wondering whether to repot...or not? Repot in spring. 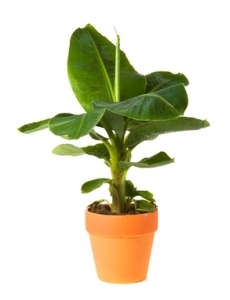 Fast-growing banana plants will have robust new growth by moving up to a larger container. Use one with drainage holes to prevent root rot. When to water. Bananas are heavy drinkers. Keep the soil constantly moist, but not soggy. If the leaves fold downward from the center rib and turn brown, the plant is thirsty. What to prune. Use pruning shears to cut off any damaged leaves. The leaves split easily, and over time can look ragged. Be selective in what you cut -- you don't want a stem with few leaves. Watch for bugs. 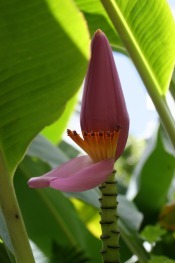 Banana plants are virtually pest-free. Watch for the webbing of spider mites. 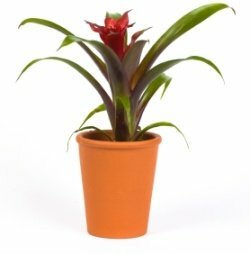 You can raise humidity and prevent an infestation by misting the foliage with tepid water. Light: Bright light to full sun. If your banana plant doesn't produce fruit, it's not getting enough sun. Growing banana plants with at least 6 hours of direct sunlight per day in spring and summer will help them to grow and produce fruit. 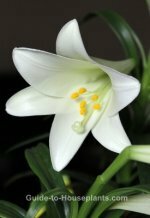 You can move your plant outdoors for the summer, just be sure to bring it inside when the temperature drops to 60°F/16°C at night. Water: Growing banana plants are thirsty, so check on your plant often during the growing season. Keep the soil evenly moist in the spring and summer, slightly drier in winter. Humidity: Moderate room humidity (50% relative humidity or higher). Take a look at these easy ways to increase humidity for your indoor plants. Temperature: Average room temperatures 65-75°F/18-24°C. Exposure below 60°F will stop all growth, and temps below freezing can kill the plant. Fertilizer: Fertilize regularly. Bananas won't grow fruit without a constant supply of nutrients. Feed every 2 weeks spring through fall with a balanced liquid fertilizer diluted by half. Propagation: Division of rhizomes. Or detach suckers that are 3-6 months old. To detach a sucker, dig down and carefully separate its roots, and pot it up separately. It takes about a year after planting a sucker for it to flower.